In Memory of Khandro Tsering Chödrön | A place to read – tributes, prayers, letters – and share your own memories of Khandro Tsering Chödrön. the supreme head of the Sakya order of Tibetan Buddhism, and a gathering of eminent masters who have a close connection to Khandro presided over the ceremonies. 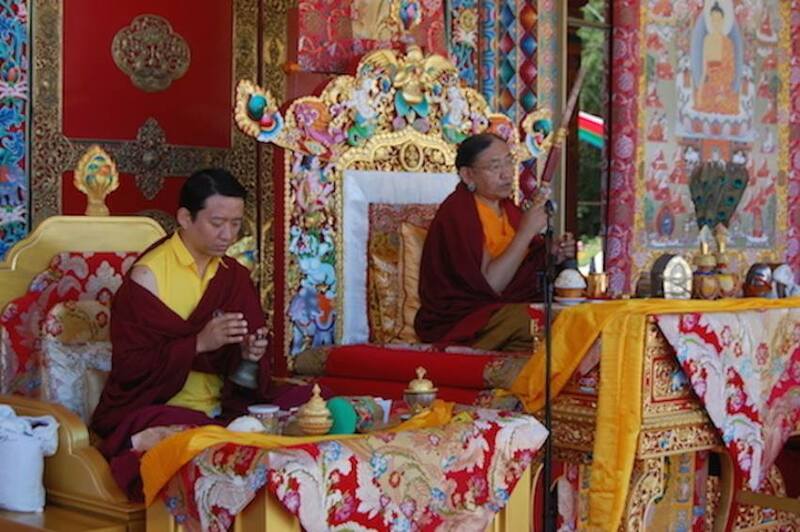 The consecration took place on Chökhor Düchen, the day that celebrates the Buddha’s first turning of the wheel of Dharma—one of the most holy days in the Tibetan Buddhist calendar. 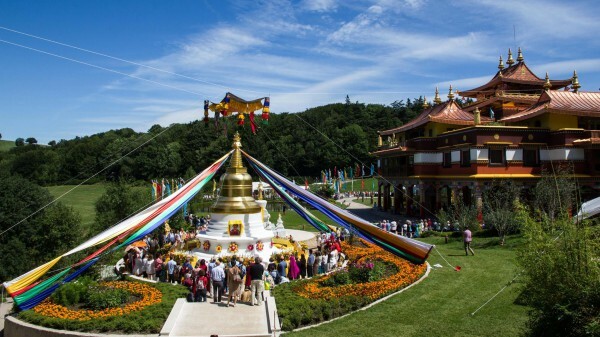 There was a joyful atmosphere as one thousand people took part in a full day of practice in the sunshine in front of the stupa, and thousands more joined via video streaming in 26 countries around the world. I was shocked to hear about our Great Khandro Tsering Chodron’s Parinirvana. She was indeed Greatest Dakini Master, who had lots of influence on sentient beings with immeasurable compassionate at heart. She has not left the world, but she will be Returner (of Lham-zhe) Four Path) on the earth to complete her un-finish task for sentient beings. I am sure she is now in Copper Colored Mountain – Guru Rinpoche’s Zangto Pelri. I visualize that in my heart, she is receiving further instructions from Guru Rinpoche. This how I visualize when she is in celestial world and with Guru Rinpoche. May Guru Rinpoche Bless her with his Mind Wang(Thug). Oh! Ati Guru Rinpoche please take care of her at Zangto Pelri. With my homage and prayers for her peace in the celestial world. To be close to Khandro-la and to serve her for the last years and especially the last six months was the best that ever happened to me. 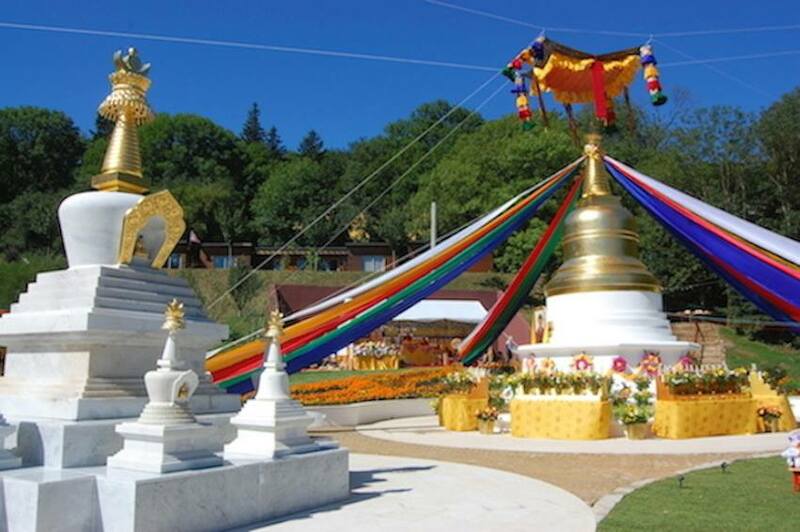 The three days after her passing, the cloudless sky here at Lerab Ling, was as lucid, blue and clear as never before. Khandro-la was everywhere, all pervasive, her presence was enormous. There was only joy, bliss and freedom: she will never die, she is beyond coming and going, and she has always been like that! Khandro-la was so incredibly well this winter, so content and cheerful, so at ease, so much with us and with everyone who wanted to see her and receive a blessing. Her door was always open and she enjoyed the visitors, who received a cup of tea, and “chiri”, some sweets and cookies. She would gently touch the faces of the ones who would dare to come that close to her and these moments were always very deep and touching, many of them started crying. Being in her spaciousness also had a strong sense of density and even speed, though all her movements were so slow and always precise. May be it is better to say that it was fullness or richness or beauty, that was so much around her and she was exuding pure love, unconditional love, all the time. I remember still vividly, even though it is now more than thirty years ago, the moment I met Khandro-la for the first time. I was on a summer retreat with Sogyal Rinpoche, my first retreat, and had taken my son Arwen, who was then three years old, with me. That afternoon I was already feeling so light and happy. Someone had taken Arwen for a walk, and I decided I would join the kitchen crew, preparing dinner for about 100 people. So I happily walked down to the storeroom, to see what would be a good choice for making dinner. That moment never lost its beauty and strength. Maybe this is a good moment to start to meditate…is there a guide ? I never had a chance to meet Khandro in person, but as a Rigpa student I feel that she has blessed us all. I am a new student in Buddhism in Belgium. As Cinzia wrote, when I saw a picture of Khandro Tsering Chodron in our center in Brussels, I felt warmth and a lot of humility and compassion coming out of her smiling face… I feel happy and the will to share a lot,each time I see her… Thank you for bringing me so much into my hart, Your smile and your love will bring a lot of light, warmness and wisdom here on earth and all places you may be. The moment I saw the Khandro’s photo, I felt like my mother loving me with smile, I felt like I am blessed by my most wanted person with warmth, humility and compassion and my tears fall from my eyes with happiness, such a beautiful, sweet and deep loving face, I wish if I have mat you in person before you pass-away. Khando Rimpochey, u look smiler to my mother and I consider my mother as U and I feel like I am blessed by U. We everybody in this world are in need of your blessing, so please bless us anywhere ur.